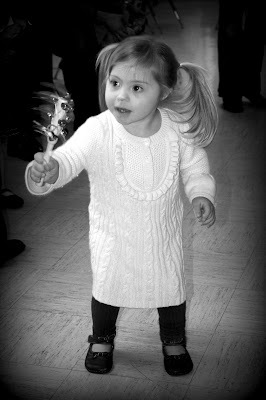 Every year our local Down syndrome group has a Christmas party and the kids have such a great time. There is always a kids entertainment band and they lay a big rug out for the kids with jingle bells and maracas so they can jam. This year's party was probably the best party we have been to, only because Payton is a little older and she can appreciate what is happening around her. She LOVES music and she LOVES to dance ... so does Nika, actually. I think the two of them danced and shook jingle bells for two hours straight today, it was so cute! What wonderful photos of the girls - it sounds like a wonderful time! That looks like so much fun! Love the photos! 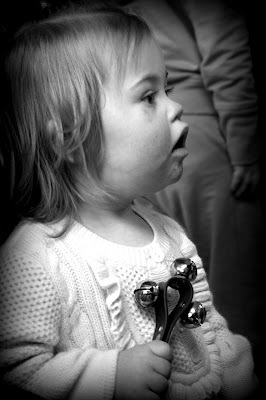 It was a particularly good year for us, too, as Samantha is walking this time around and has finally figured out how to move her feet to music. I think she had fun dancing with Payton, and it was wonderful to meet Nika! She's such a little ball of sunshine! I hope Mason started feeling better about his outfit--he looked so handsome! I am so bummed that we moved away before having a chance to meet and enjoy the DSANV events. Totally my fault that I didn't attend the 2007 Buddy Walk, but I just wasn't ready yet.